So, here it is. This is the one everyone has been waiting for. This was the most respectable Zeppelin reunion to take place since the band lost John Bonham in 1980. Page and Plant got together and did their little unplugged No Quarter, orchestrated, Indian influenced excursion in the mid-90’s, but that wasn’t Zeppelin. This concert took place on December 10, 2007 at the O2 Arena in London. This was billed as Led Zeppelin, and it was definitely plugged in. The main concern I had about this performance was singer Robert Plant. Was his voice anywhere close to being able to perform old Zep stuff? Also, what kind of passion would he have for the material? In recent years, Plant has distanced himself from the Zeppelin style, and rock music in general. For me, he would need to bring his heart and soul, as well as something decent vocal-wise. I know that a great many folks were worried about Jason Bonham filling the shoes of his legendary old man on drums. John Bonham had so much to do with the overall bombast of Zeppelin’s sound. Many wondered if Jason would be able to achieve that sound, especially in a live setting. I didn’t have too much doubt about Jason. Having followed his career from his early band, Bonham, I was pretty sure he’d show up prepared. As for John Paul Jones and Jimmy Page, I think we all knew these two would be in top form. Now, there are nine different options for purchasing this set. Yeah, I know, it’s ridiculous. Between CD’s, DVD’s, Blu-Ray’s, and bonus material, you’ll go out of your mind in the middle of your favorite music buying paradise. Let me make it simple for you. Make sure you get the 2 CD audio, and make sure you get the video or DVD of the concert. I usually love bonus material stuff, but the bonus disc here is pretty lame. The rehearsal bonus DVD is just that. It is the band running through the exact setlist that you get with the actual concert, and it seems to be shot on inferior camera equipment and from only one angle; the camera probably perched upon a tripod. I thought it might be interesting to see the interaction between the guys in a no pressure rehearsal setting, but it’s nothing like that. Not one word is shared between them. Save yourself a few dollars and pass on the bonus rehearsal DVD. The first thing you’ll notice is the production of the audio CD’s. My good Lord, this thing is a production masterpiece. The drum sound is crisp and clean, while maintaining that big pillowy bass drum sound you want from the Zeppelin sound. Jones’ bass is perfect in the mix, and Plant and Page sound like they’re in the studio. Even the crowd is mixed in at a perfect level that creates an edge of intensity and anticipation. This is probably the best sounding live album I’ve ever heard. The next thing you’ll notice is the setlist. Oh baby. I couldn’t have asked for too much better than this. Would’ve loved “The Ocean” or “Heartbreaker/Living Loving Maid,” but this is near perfection. You get “For Your Life,” originally from the Presence album, which the band had never performed live until this show. And maybe my favorite Zep tune, “In My Time Of Dying,” is included in all of its glorious 11:11 of runtime. Usually my biggest complaint about these types of shows is the setlist, but I really am thrilled by what they put down here. So, it’s all down to those nagging questions about Robert Plant. Well, to say that Plant was a picture of perfection may be stretching the truth, but he was in fine form. He did dance around many of the higher notes, but nailed quite a few of them as well. The best showing of his former vocal strength came by way of the classic, “Kashmir.” Most of the high notes and passion of the song was placed on exhibition with great success. He was not a 25-year old Robert Plant on this night, but he definitely gave a performance that will be highly respected by even the harshest critics. As for his passion for the material, I think he had fun and felt good about what he was performing. We even get a little “push, push” on “The Song Remains The Same.” Again, he may not have been as intense as the 25-year old Plant, but he also did not appear to be “going through the motions” either. Perhaps the most exciting thing about this whole event is the inclusion of Jason Bonham. In the liner notes of the package he calls it the “greatest day of my life,” and recalls coming off the stage after the last song and collapsing in the dressing room and bursting into tears. After reading his heartfelt and excited, almost childlike take on the show, I couldn’t help but feel great for him. As far as his skills behind the drum kit, it’s abundantly clear there is no one better for these songs. He plays every single note exactly like the record. All the small percussion, all the fills, and the overall sound is beyond perfection. I always have a complaint when I hear anyone do “Rock And Roll,” because the drum sound on the intro is NEVER correct. I’ve heard bands in my local bar, and I’ve heard Hall Of Famers try to get it right, and they all fail. As they close this show with “Rock And Roll,” I really think John might’ve been in control behind the kit. It’s the best rendition of “Rock And Roll” since they cut the track in the studio for their fourth album. Jason Bonham, with or without the ghostly help of his father, is sheer perfection here. I think it is now obvious that this will be the last thing that the mighty Led Zeppelin will do together. I would love to see them tour or put out new material with Jason filling the huge void left by his father, but it looks extremely unlikely. 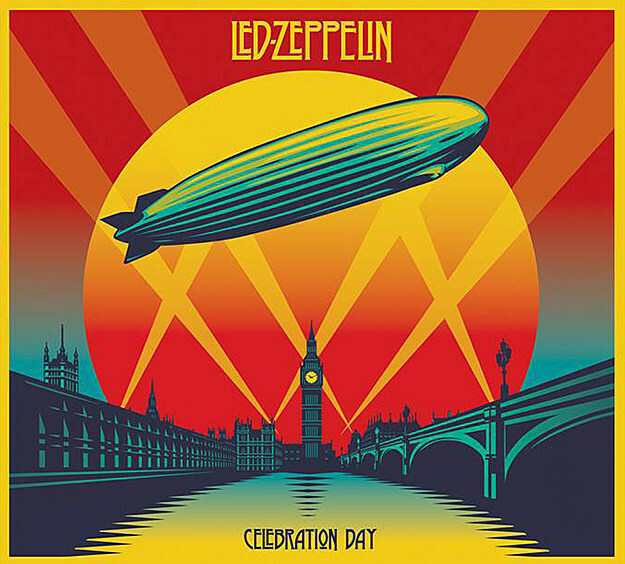 So, this Celebration Day package gives us one last look at what is arguably the greatest classic rock band of all time, and they look damn good.